Although Frank’s Jewish background was never explicit in his photographs, the effects of his Jewishness were. During the 1950s many Jews were immigrants coming to new countries after WWII. Frank, like many other Jews, was an newcomer and wanted to quietly observe and assimilate without disturbing anyone. Frank created the photo book, The Americans, with the mindset of, “what one naturalized American finds to see in the United States that signifies the kind of civilization born here and spreading elsewhere.”(5) As a foreigner in a new country, Robert Frank wanted to capture American culture without disturbing people’s natural activities around him. To do this, Frank would hide his camera in his jacket and take photographs from his hip, making his photographs seem taken from a stalker’s point of view rather than a photographer’s. He would quietly snap photographs so his subjects would not change the way they acted or portrayed themselves. One common theme found in Frank’s work is people’s eyes. When his subjects were captured in their natural states, many of them were caught in a gaze, leaving the audience pondering about their thoughts and purposes. 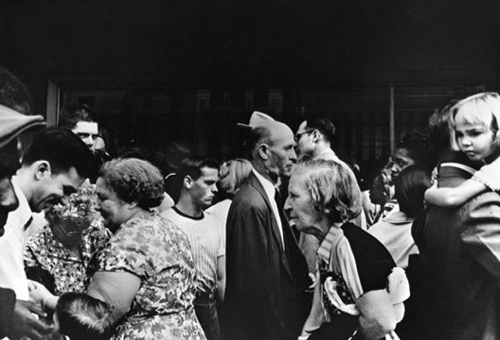 Frank wanted to gain an honest understanding of American tendencies and said that his photo book was, “…personal and, therefore, various facets of American society and life have been ignored.”(6) With this mentality, Robert Frank wanted to capture the darker parts of American society that drew his attention. Some believe that The Americans has an underlying melancholy and menace to it, which at first seems un-American, but in reality it exploits the America that foreigners have not heard of or seen in America in the 1950s. A quote from Frank that stood out to me was “’There is only one thing you should not do, criticize anything,’ Frank said of America, writing to his parents in Zurich, a week after he had first arrived in New York.”(7) With that being said, Robert Frank was a realist and was not interested in the photographical norms of the 1950s. Frank thought that “neat and clean pictures were insufficient to describe and capture life.” While I get the pleasure of taking photographs with Frank’s methodology, I too will see through the lens with a realist perspective. I plan to take photos of Ann Arbor natives in their daily routines that embody the themes in The Americans. Like America, Ann Arbor is filled with people that come from all over the world. The students at the University of Michigan are from different states and countries but coexist and are apart of the Ann Arbor culture. The relationships they have with each other and the effects of being a student at the University will be an illuminating topic to explore. Frank, when photographing large crowds, was able to aesthetically place different types of people into one picture with a purpose. With the combination of a diverse group of people come unspoken and ignored divergent behaviors. For example, I would like to take pictures of places where there are many people, yet they are segregated in groups by their own ethnicities. In addition, as Frank captured class distinction, I intend to photograph the juxtaposition of the homeless, humbly begging for the absolute minimum to sustain life, with the overwhelming wealth that can be found in Ann Arbor. 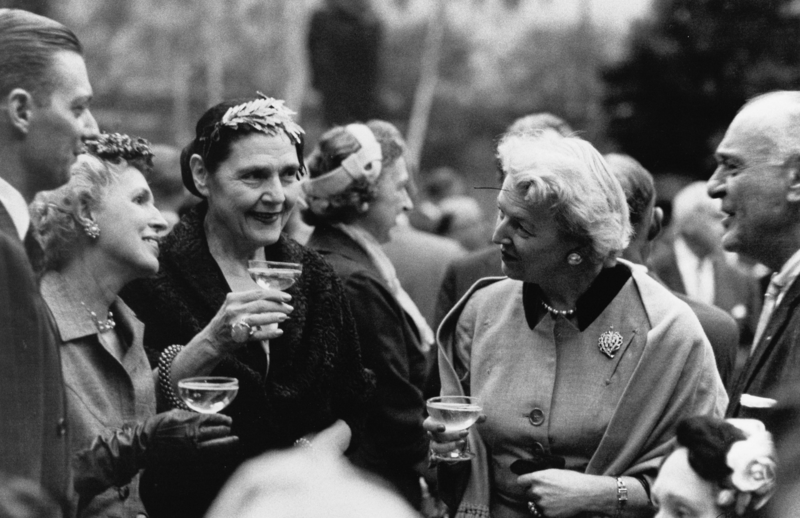 Frank’s keen eye to illuminate the overlooked, broke barriers in the photographical society in the 1950s. Robert Frank, as a foreigner and immigrant, was drawn to the way the people in America portrayed themselves, most of the time unknowingly. One of Frank’s common themes found in his photo book is gestures. For example in Frank’s photograph, “Cocktail party – New York City,” the ladies in the photograph are unaware of their entitled, spoiled postures. Frank lets his audience take a moment to illuminate their obnoxiousness that they have become used to. 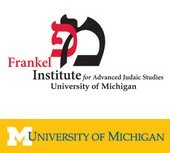 In Ann Arbor, although there is class distinction, it is hard to discern. It is, however, obvious how ridiculous some students look at parties and around campus. I will try to exploit the disturbing images of the effects of intoxication at the University of Michigan. I want to photograph this topic because I do believe it plays a major role at this school, and it would be interesting to see the honest, downside of it, when today it is glorified in social media. Moreover, Frank used a combination of depth and focus to provoke a certain emotion from the audience. An example of his photographical expertise is found in the photo, “Canal Street – New Orleans.” In this photograph, Frank uses the people in the crowd as layers to show depth, while not sacrificing the crisp focus of emotion painted across each person’s face. In Ann Arbor, the people may seem similar when in fact they are very different. I want to take pictures of Ann Arbor’s crowded street and for my audience to be drawn to the different styles, looks, and mannerisms found in each person. With the quirky, academic, and spirited nature of Ann Arbor, my photos will embrace Ann Arbor’s culture, while provoking my audience. As I take my own photographs of the world around me, I will use Robert Frank’s influence of realism while staying under the radar. I plan to photograph the crowded streets of Ann Arbor, the different types of people in the most popular places on campus, the daily occurrences that embody the city’s culture, and, of course, the unfortunate darker parts of campus. In addition, I will carry around a camera discreetly, or use an iPhone if I feel that I cannot take photographs without going unnoticed. The depth and focus of each photograph will depend on the location and subjects, but they will definitely add to the aesthetics of the photo and help the audience interact with the picture. With Robert Frank’s ethnographic methodology, the photographs I take will invoke Ann Arbor’s culture to my audience. 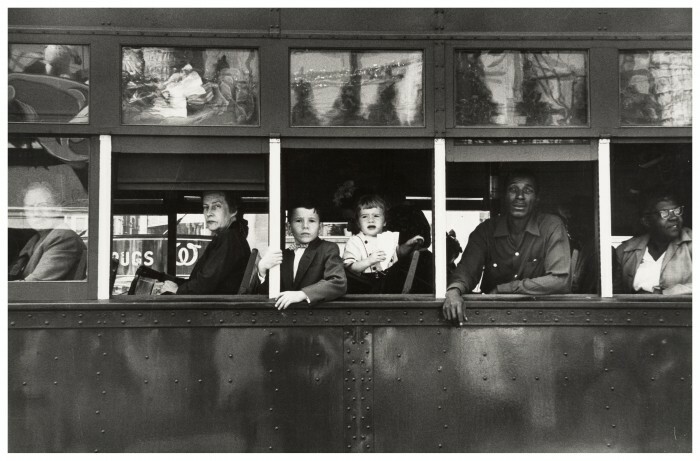 I liked how you uncovered the essence of Frank’s photos — diversity and the contrast of wealth and poverty. I’m interested to see how Ann Arbor, being the diverse city it is, plays out as your subject. If you go up Geddes and take photos of the nice homes there and contrast them with the homes by the Salvation Army and the train tracks could be interesting and similar to Frank’s work. I really like when you talk about who your going to take the picture of. I would really suggest taking a picture of those people who sit next to espresso royal and sing and drum. They are a perfect example of the different group that make up America. the beauty in America is that it has many faces. I think you should try and take pictures of as many different looking people as possible. For sure that guy who played that instrument in front of the Ugli. You’ve gotten some good comments from Russ and Jared, although I particularly like your own observation about the bus stop. Next time I walk by (or take a bus), I’ll notice. Frank was very good at seeing social relations among people expressed through ordinary activities–walking, listening to music, eating, working, praying. I think that you might include at least one of Frank’s Ann Arbor photos. It is worthy of your consideration. You need footnotes for the quotes. You had them in the thesis and background section but not here. Also, I think that if you bold the quote, “there is only one thing . . .” you don’t need to bold the part that comes after it. You do need to footnote the source. Good discussion of the two Frank photos.